Are you running out of space in your home? Is your family expanding and you need some additional room? If you've been contemplating finishing your basement, we would love the opportunity to sit down with you and discuss all of the options available. 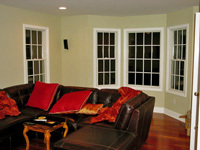 We can renovate your basement to give you the additional living and storage room you desire. From flooring to light fixtures we will walk you step by step through the variety of choices available to best fit your home and basement remodel.